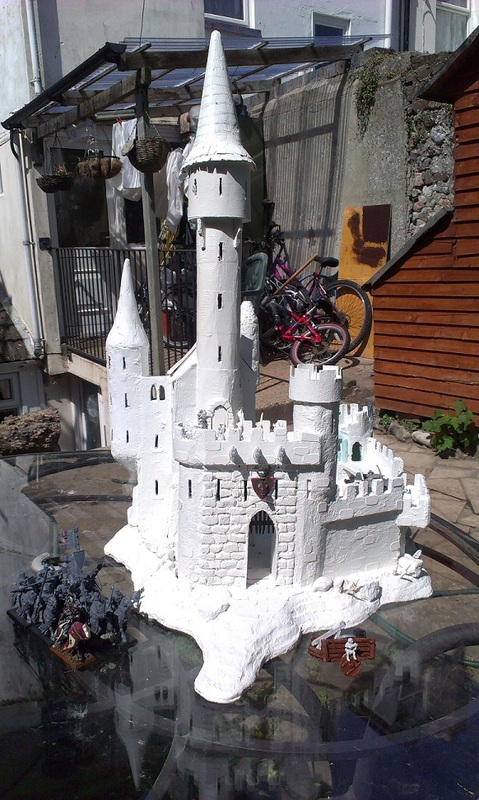 The inspiration behind this castle, probly began with a lifetime of fascination with castles, and history. 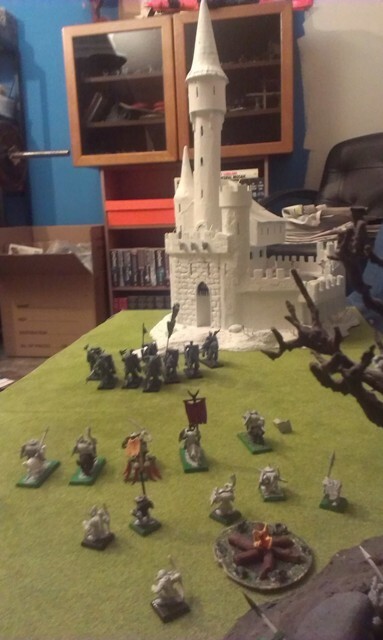 I have a passion for making models and after making woods, a tavern, and a fort for my warhammer figures, a castle seemed like the next big challenge. The Bretonnian army, seems to more based on the French in the medieval times then the English, and so I looked to French castles to fuel this fascination. One French castle from which this inspiration sprung was the fantasy castle of Peirofonds. Sitting on domminant struck of cliff, in a picturesque little village. Constructed entierly from Blue foam board, (which is strong, rigid, and very easy to cut) thick cardboard, a variety of glues and adhesives, filler, plaster, and bitz. The rest, imagination and a whole lot of improvisation! :An Orc raiding party, jumps out of the wood. In siege conditions, the castle could hold a garrison of one hundred defenders. Not including possible room for others in the vaults bellow the Castle hill. The Castle contains room for 40 defenders on the walls and towers, 63 arrow slits, and old cannon in the old chapel window. 3 walls, strong gatehouse, and one of my favourite parts, made specially for the army of Bretonnia, a Trebuchet platform! The castle does have its own well, and stables beneath the keep. Five battle towers, and the new addition of the Octagon tower,(replaces the D tower) ensuring that all angles of approach are catered for.